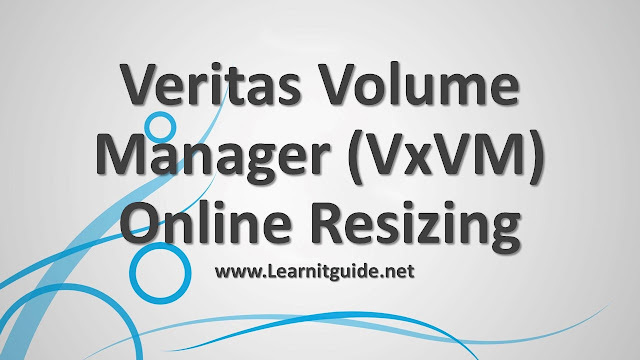 Veritas Volume manager (VXVM) is very flexible and reliable volume manager to resize volumes without un-mounting it. Resizing the volumes are very common now and this has to done on fly without any downtime. 1. How to find the total diskgroup size? 2. How to find maximum free size available in Diskgroup to extend or increase? 3. How to find the size of an existing volume upto how much it can grow? 4. How to increase or extend the Volume size? 5. How to resize the Volume size on fly means without unmounting the volume. To achive this, we can use "vxassist" and "vxresize" commands to resizing the size of the volumes which means increase or reduce the size of volumes. There are two parameters which can be used along with "vxassist" command to find the space available in a Diskgroup to know how much it can be increase or extend. 1. Maxsize - Use this option to find the size to which a new volume or existing volume can grow. 2. Maxgrow - Use this option to find the size to which an existing volume can be grown to. 1. How to find the total diskgroup size in Veritas Volume Manager? Above output shows that, mytestdg diskgroup is initiated with the disk "sdb" and the size of the disk is 0.91G. Volume "testvol1" size is 0.48G. Where "mytestdg" is our Disk group name. Above Output shows that we have 441Mb of free volume size. This can be used to create a new volume or extending the existing volume. 3. How to find the size of an existing volume upto how much it can grow. Current size of the volume is 0.48G, we had found the size in the 1st point itself. So the volume can be increased to 941Mb. There are multiple options available to resize a volumes using vxassist. How to extend the Volume size in Veritas Volume Manager? Option 1: To extend or increase the volumes to specific size 500mb, use growto option. so your total volume size would be 500mb. Option 2: To extend or increase the volumes by specific size 800mb, use growby option. so your total volume size would be added with the specified size. To resize the mounted volume size in veritas volume manager on fly without unmounting. How to reduce the Volume size in Veritas Volume Manager? Option 1: To reduce or decrease the volumes to specific size 500mb, use shrinkto option. so your total volume size would be 500mb. Option 2: To reduce or decrease the volumes by specific size 800mb, use shrinkby option. so your total volume size would be reduced the specified size from the total volume size.